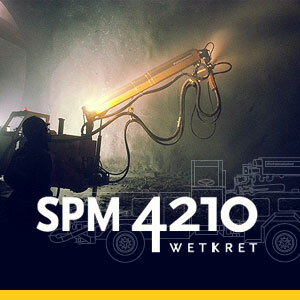 In the world of underground construction, there are two main methods for the excavation of tunnels in rock: conventional excavation methods and mechanized excavation methods. The former includes the powerful Drill & Blast technique, while the latter is best known for excavation by way of impressive Tunnel Boring Machines (TBM). In today’s post, we’re going to look at how the two techniques stack up against each other, and hope you dig into the content like a mole on a mission! TBM and Drill & Blast: what’s each method all about? We’re actually talking about two very distinct methods. For starters, excavation using TBM is mechanized, with a huge tunnel boring machine piercing the rock with its rotating drilling head and removing the spoil. Depending on the type of terrain, it can also secure the excavated tunnel with shotcrete. But how is one to know when to employ one method or the other? Let’s have a look-see. 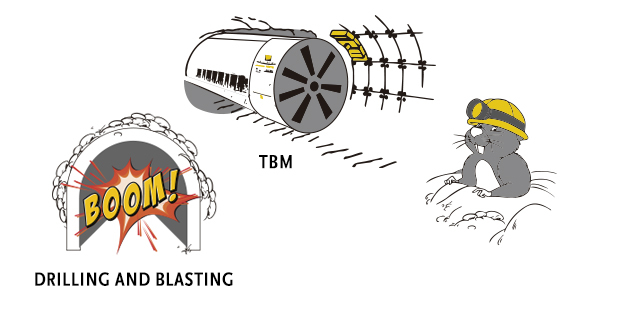 TBM or Drill & Blast: which do I choose? 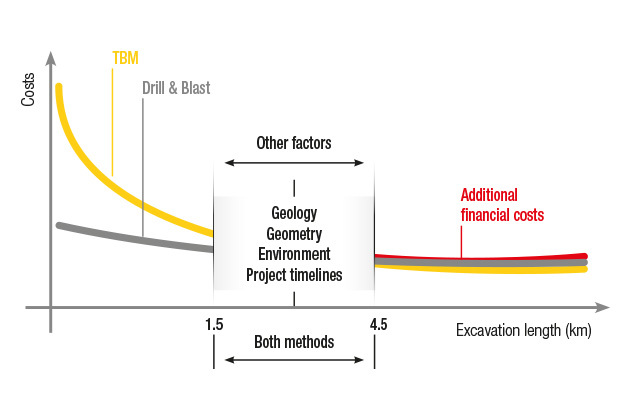 As a rule, for excavation lengths longer than 4.5 km a TBM is often recommended, while for lengths not exceeding 1.5 km, the Drill & Blast technique is usually the go-to. Bear in mind that this rule is not set in stone, and you may very well come across a 5 km tunnel being excavated using Drill & Blast, and a 1 km tunnel being excavated using TBM. Which is why each case much be studied individually. For tunnels with excavation lengths between 1.5 km and 4.5 km, costs are comparable, and so other factors must be taken into account: those relating to geology, geometry, the environment and project timelines. Side by side: how do the two methods stack up? In addition to the factors listed above, there are also significant differences as far as costs are concerned – TBM minimizes workforce-related expenses, as well as expenses related to the construction of temporary structures and over-consumption of concrete. This last perk is due to the fact that when excavating using TBM, over-excavation is not an issue, while the same cannot be said for a Drill & Blast excavation. That over-excavation is what causes there to be a difference between the real and theoretical concrete. Trends: what will the future bring? Although TBMs are mostly used in tunnel construction, there are those who think that they could be quite beneficial to the mining industry, as well – they’re particularly well-suited for main access tunnels, exploratory bores and ventilation tunnels (and other long tunnels), offering boosts in productivity and accuracy. That being said, there are already cases in which TBMs are being used in mining. Take, for example, Stillwater Mine (Montana USA), which has been employing TBMs for the last three decades. What’s more, mines in Chile, Australia and China hope to add TBMs to their fleet in the not-too-distant future. As for the TBMs themselves, the future looks bright: more and more, the machines are being manufactured with versatility in mind. This means that instead of the single-use TBMs that have dominated the landscape up until now, we may very well bear witness to TBMs that can be used in multiple projects with small variations. Although assembly and disassembly costs will still play a part, the initial investment will enable use in multiple projects – which is no little feat!